Brussels - The European Union calls on all parties to the Western Sahara issue to seek a negotiated settlement, said Vice-president of the European commission, Fedredica Mogherini. 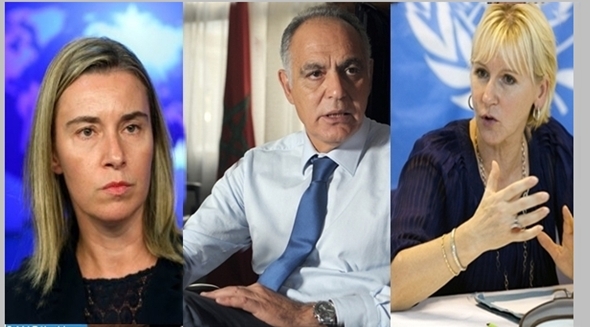 Brussels – The European Union calls on all parties to the Western Sahara issue to seek a negotiated settlement, said Vice-president of the European commission, Fedredica Mogherini. Mogherini, who is also EU’s high representative for foreign affairs and security policy, said “the EU encourages parties to seek a negotiated settlement to the conflict and supports the UN process”. She went on to express the Union’s concerns over the persistence of the conflict and its implication on security and the respect of human rights in the Tindouf camps and on integration in the region. This statement comes following reports that Sweden intends to recognize the self-proclaimed Saharawi Arabic Democratic Republic (SADR). The alleged move caused an uproar in Morocco and caused the Moroccan government to hint that he would take retaliatory against the Swedish government. Last Thursday, Mustapha El Khalfi, Minister of Communication and government’s spokesperson, announced that Morocco had decided to boycott Swedish companies and products. The Minister went on to ad that Morocco will not tolerate that its “stability, territorial unity and its commercial interests be threatened,” the Minister added. The Swedish government has swiftly reacted to the firmness shown by the Moroccan government. In a statement to MWN, on Thursday, the Swedish Ministry of Foreign Affairs said that it had not decided to recognize the so-called SADR. In another statement sent by the Swedish Ministry of Foreign Affairs to MWN on Tuesday, Stockholm stresses that its policy with regards to the Western Sahara is still under review and will be completed by next year. “The Government is currently conducting an internal analysis of Sweden’s policy on Western Sahara, in light of the interest in this issue in Swedish society. The analysis is in progress and is expected to be completed early next year,” the statement said. “Sweden wish to have continued good relations with Morocco,” it concluded.